Please be sure to read through this entire description thoroughly. It is packed full of useful info on our buildings and outlines the entire process which may help answer a lot of your questions. This building is priced for VA, NC, SC, GA, TX WV. WELCOME TO EAST COAST HOMES. We are authorized dealers in the steel building industry and offer top of the line metal buildings including car-ports, garages, RV covers, boat covers, horse barns and MORE! Our steel structures can be designed to fit almost any need that you might have. All of the buildings that we sell are manufactured with top of the line materials ins of up to 180' wide (120' clear), 22' tall and as long as you may need. We are partnered with 8 of the top steel building manufacturers in the industry making us nationwide dealers of quality steel structures. 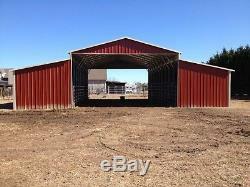 44x31x12x8 Vertical Steel 3 Section A-Frame Barn. 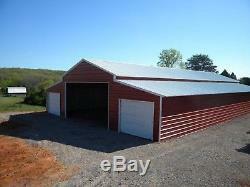 This is a 44' wide x 31' (30' long base-length due to 6 overhang on both sides) long fully enclosed steel barn. A-FrameVertical roof style with vertical oriented sides and end panels. Vertical roof allows for run-off of rain, snow and debris as grooves in panels run from the center peak down sides as opposed to lengthwise of the horizontal roof. Center section is 20x31x12 (side height) with gables. Sides of the center section are not closed in. Attached to the center are 2 -10x31x8 lean-to's each. They are each closed on the outter sies, front and back.. The building is priced with standard 14-gauge frame. This is 2 1/2" x 2 1/2" galvanized square steel tubing. Heavier thicker 12 gauge frame upgrade is available. Concrete anchors are included for slab installs. For ground install mobile home anchors are required for certification and are NOT included in pricing for all states. Please inquire on extra cost for appropriate anchors for ground, gravel and asphalt installs. Is fully braced and is engineer certified to meet MOST local code including snow load and wind requirements. Customer is responsible for checking local wind and snow loads and making sure that your building is priced to meet. Add or remove any options/features, etc. Please be sure to include your zip code. We cannot possibly know or check with every city/county for each and every customer but we can be sure that we price to meet your codes so please make sure to inform us of your required loads. If you're in one of these states and your site is on land zoned agricultural OR are not planning on getting a permit, please let us know so that we can deduct the price of the drawings from your total. Calcs are available at additional cost if city/county requires them. Many other states include a free set of generic engineered drawings (please see "Building Permit" section below for more details). If your city/county will not accept our free generics and require building specifics, they're available at an additional cost (depends on location). PRICES VARY FROM STATE TO STATE BC WIND & SNOW LOADS VARY. OUR BUILDINGS ARE PRICED & DESIGNED TO MEET LOCAL CODE IN YOUR STATE. WE USE MULTIPLE MANUFACTURERS W/ DIFFERENT PRICING TO COVER AS MANY STATES AS POSSIBLE. To Request Quote for ANY SIZE & ANY STYLE Building! Please be sure to include the following for faster service. Size & style barn style, i. Main unit w/ lean-to's, garage, clear building, etc of building including, and in the form of, Width x Length x Leg Height. Ex: Roll-up garage doors, walk-in doors, windows, insulation, sky-lights (not available in all states), etc. 14 Gauge 2 1/2" x 2 1/2" (varies among manufacturers) Steel Frame/Tubing. Welded Center Braces on Every Roof Bow for Strength. Rebar Anchors for Ground Installation. Concrete Bolts or Concrete Wedge Anchors for Cement Installation. Horizontal Sides & End Panels for Enclosed Buildings. 12-14 Different Color Options- You get to choose your roof, sides/ends and trim colors. All doors and windows will be white. Engineered Certified Units up to 170MPH /120 PSF Depending on state and building.... Stronger 26 Gauge Sheet Metal (not available in all states). 12 Gauge Framing Double Leg Option. Extra Bracing & Welded Trusses. Vertical Side & End Panels. Web Welded Truss Designed Framing. Overhead Doors as Large as 18'x18' (not avail in all states). Multiple Roof Styles- Regular, A-Frame Horizontal Boxed Eave or A-Frame Vertical Style. Sky Lights/Clear Panels (not available in all states). Insulation- Up to R-Value 29. Interior Steel Walls and/or Horse Stable Frame-ins. Windows and Doors that have a "Residential" Look. Dutch 45 Degree Frame-Outs (for openings with and without our doors). Site and Building Specific Engineered Sealed Drawings and Calcs. BUILDING SIZES OF UP TO 180' WIDE, 22' TALL AND AS LONG AS YOU COULD POSSIBLY NEED.... Lift will need to be a t. Elescopic boom forklift at least 6k and 40' reach. All of our listings/prices are for certified buildings- uncertified available in most states upon request. Built to Engineered Specifications to Meet MOST Local Code Wind and Snow Load Requirements. FL goes up to 170MPH. Snow Load Certification of up to 120PSF (Depending on State). Customer is responsible for checking all wind/snow load requirements via local building dept. Certified Anchoring Using Mobile Home Anchors For Ground Install and Concrete Bolts or Wedge Anchors for Cement. Free Set of Engineered Drawings for Obtaining Permit in MOST states. Drawings are generic sealed/stamped and are for an enclosed building and cover a of sizes. 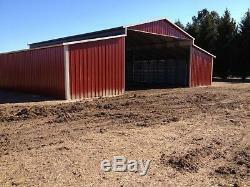 Lean-to specs are within them as well but are not specified for a barn. If your building does not fall within the sizes that they cover or if your city/county requires site and/or building specific plans, there will be an additional charge. A concrete slab/pad is not required for most of our buildings (certain larger commercial buildings do require slab or permanent foundation) and we can install right on the ground. Other examples of installation surfaces include. When pouring a slab please note that frame size specified in ALL of our steel structure listings is actually 1 FOOT shorter than stated roof length due to 6 overhang on both sides. 18' wide x 21' long building, will have a base length of 18 x 20 and will need a slab size of at least 18' x 20'. We REQUIRE a Level Surface for Your Building Within 3. We can always adjust legs to be higher on one side/end if your surface is not level. If you plan on getting a permit than certification is required in order to meet the IBC code requirements. These drawings are generic stamped drawings with seal (no wet seal) and they cover a of sizes. They are for an enclosed building and include lean-to spec within however are not specified for a barn. If your building is not within the sizes they cover, then you will need a site building specific set in which there will be an additional charge for. 100% FREE WITH ALL NON-COMMERCIAL BUILDINGS!! WE REQUIRE A LEVEL SURFACE FOR YOUR BUILDING WITHIN. FAILURE TO DO SO CAN RESULT IN DELAY OF SETUP. If we do not have listed the size or style of building (including features) that fits your needs, we would LOVE to help design and price one that works for you! EACH PHOTO IS CHOSEN SPECIFICALLY TO REPRESENT SIZE, STYLE & FEATURES AS BUILDING LISTED. PHOTOS ARE TO SIMPLY GIVE BUYERS A GENERAL IDEA OF UNIT WE ARE OFFERING. PRICE INCLUDES ALL OPTIONS SHOWN IN PHOTO AND AS DESCRIBED. Thank you so much for visiting East Coast Homes! We are here to help so if you have ANY questions at all, please don't hesitate to ask. TO ORDER OR INQUIRE TODAY! PLEASE DO NOT FORGET TO INCLUDE YOUR ZIP CODE IN ALL. 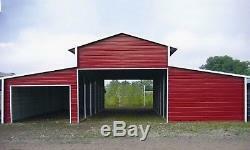 The item "Metal 44x31 A-Frame Steel Building Horse Animal Barn Agricultural FREE INSTALL" is in sale since Wednesday, October 24, 2018. This item is in the category "Business & Industrial\Building Materials & Supplies\Modular & Pre-Fabricated Buildings". The seller is "eastcoasthomes68" and is located in Suffolk, Virginia. This item can be shipped to United States.